Pull up a chair and let's chat about the 1903-O Morgan Silver Dollar. This little guy (or should we say little gal?) has one of the most unique price trend histories of the entire universe of United States coins, so it is worthy of an article all unto itself. Morgan dollars were minted continuously from 1878 to 1904, and then again in 1921. For decades following the conclusion of the Morgan series, they were not collected feverishly like they are today, although there was some significant numismatic value associated with a handful of dates. Things were going along swimmingly well from 1950 (and before) to 1960, but by 1965, values for the 1903-O absolutely cratered, falling 93%. WTH happened? The scan below is from the 1966 Redbook (released in 1965), showing the 1903-O had fallen to $35.00 in Uncirculated condition. There is a logical explanation. 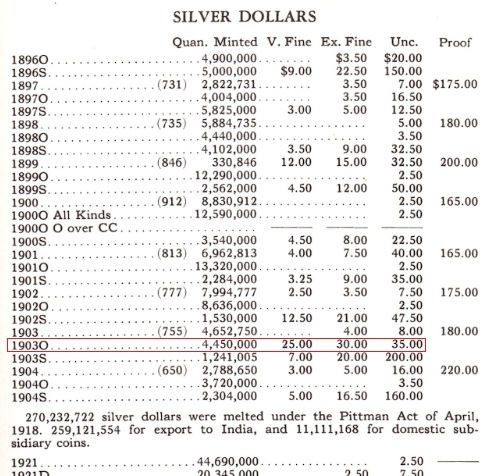 According to mint records, a plentiful 4,450,000 silver dollars were struck at the New Orleans Mint in 1903, meaning it wasn't exactly a rare coin coming out of the starting gate. 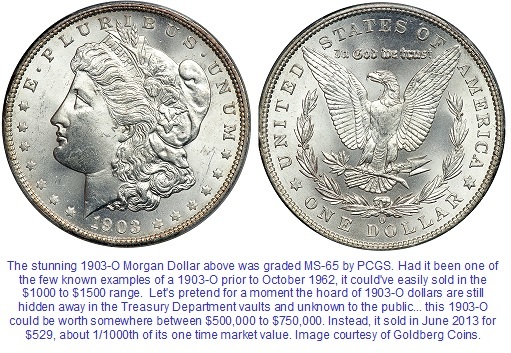 Yet most coin dealers had hardly seen a 1903-O Morgan dollar, especially in Uncirculated condition. Why were there so few examples seemingly in existence? Where did they all go? Did they perish in the great silver dollar meltdowns or what? Whatever the cause, the law of available supply and demand pushed the 1903-O to the highest echelon of Morgan silver dollar rarity and value. 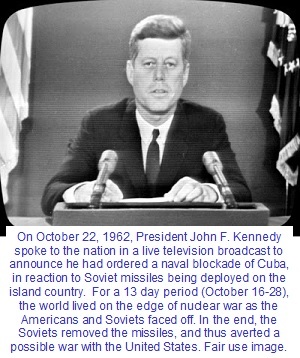 October 1962 is best remembered for the Cuban Missile Crisis, when the world teetered on the verge of global nuclear war. That same month, another event, much less threatening, exploded in the numismatic world with the fury of 100 atom bombs: the Treasury Dept was releasing to the public millions of Morgan dollars, heretofore hidden away for decades in government vaults. Many of them were still sealed in their original mint bags, consisting of 1000 coins each. By November, there were rumors that "some" 1903-O dollars were included in the hoard, but soon it was apparent there was a flood of them hitting the market. Hundreds of thousands of them actually, just as shiny and new as the day they were struck. Numismatic scholars no longer had to theorize on the fate of the "M.I.A." 1903-O dollars. They now knew many of them never left the Treasury Department. As the supply of 1903-O dollars went from virtually zero to bountiful abundance, prices plummeted rapidly. What was once selling for $500 to $1500 fell to $15.00 or less retail within literally a few days. Some collectors were even fishing them out at banks for face value. Anecdotes abound to this day of unsavory characters moving swiftly to sell 1903-O dollars at "bargain" prices to buyers who had not yet heard the latest news of the Treasury release. The 1903-O was not the only "rare" Morgan Dollar whose identity was altered. For example, the of 1898-O and 1904-O suffered similar fates, though not nearly as dramatically as the 1903-O. The October 1962 Treasury release of Morgan Dollars and the publicity it generated ushered in what some would call the modern age of Morgan Dollar collecting. Prior to this event, most Morgans were unloved, unwanted, and ignored. Their profile now elevated, collectors started to take more interest in Morgan Dollars, and why not? They had a lot going for them: historically interesting, esthetically pleasing, a healthy supply of quantities, dates and varieties to study, with a smattering of bona fide rare dates mixed in. By 1965, a typical Uncirculated 1903-O was "redbooking" at $35.00. No longer was this erstwhile rarity to be envied, but neither was it the very low end, either. It's fair to say the 1903-O had finally found its correct equilibrium. In 2015, a 1903-O in MS-60 condition sells somewhere in the $400 range. 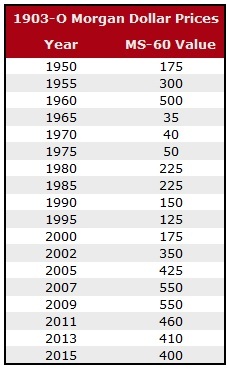 Not bad, when one considers nearly half of the Morgan Dollar dates sell for $100 or less in the same grade. You can choose from a wide assortment of available 1903-O examples on eBay . But think about this... the 1903-O was once the equal of the lofty 1893-S. Today, it takes about $150,000 to purchase an 1893-S Morgan in MS-60 Uncirculated condition. 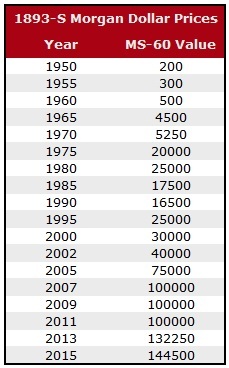 Had not the Treasury Department rained on it's parade, the 1903-O would probably be cruising at above $100,000 today. What a difference a few hundred thousand "discovery" coins makes! You can extensively study the long range pricing history of the Morgan Dollar series by visiting a series of Coin Value Tables we've researched for our online audience. There is no charge to use the tables, and no strings whatsoever. We have a downloadable PDF report available with the same data as the Tables, plus some bonus features. There is a small charge if you'd like to download the PDF.